AIRBOURNE sind wieder on the road und sie haben ja bekanntlich schwer den Rock'N'Roll im Blut. Neu mit dabei, ihr alter Kumpel Matt 'Harri' Harrison, der Langzeitmitglied David Roads ersetzt. Nichtsdestotrotz ist jede AIRBOURNE Show absolut energiegeladen und wir freuen uns schon sehr auf euch! “As the old saying goes, ‘you can take the boy out of the country, but you can’t take the country out of the boy’. We say, good on ya mate, well-played and good luck! “Now to the future, and its all guns blazing foot to the floor! 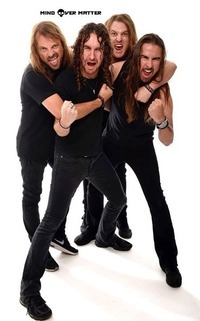 In the coming months, we look forward to introducing you to our new AIRBOURNE Brother, he’s our long time staunch mate Harri ‘The Riff Doctor’ Harrison. Possessing a gifted Rock’n’Roll right hand motor he already ‘fits in like a well-greased piston into a V8’ and we are all pumped to be bringing his powerful locomotive-like rhythm with us to rock the summer festivals! “Cheers and see ya soon rockers!” – Joel, Ryan & Streety.